Willis Creek flows a long way, from the base of the Pink Cliffs in Bryce Canyon National Park through high country at the edge of Grand Staircase-Escalante National Monument before joining Sheep Creek which eventually meets the Paria River. Several springs ensure its waters flow year round, and just after the crossing of the Skutumpah Road - the unpaved route between Johnson Canyon and Cannonville, the creek enters a moderately deep gorge and passes through several short but very beautiful sections of narrows. 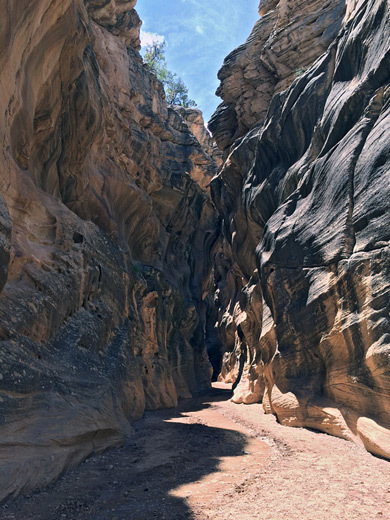 Unlike some other canyons in this area, Willis Creek is very easy to explore, with no obstacles of any kind, just a flat, stony streambed enclosed by shapely, delicately colored walls of Navajo sandstone. The creek flows over the Skutumpah Road 7 miles south of the Paria River and about 2 miles from Bull Valley Gorge, at which point the stream is enclosed by a wide, shallow valley and is (usually) the only running water that crosses the road; it disappears tantalizingly into a swirl of sandstone just a few yards beyond. There is a large, flat area for parking and/or camping just north of the creek. 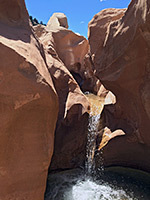 Willis Creek is within Grand Staircase-Escalante National Monument and no permit is needed for exploration. 12 views of Willis Creek. TopoQuest topographic map of Willis Creek. The depth of the clear, fast-flowing water is typically just 1-2 inches, and the canyon floor has no mud or potholes, just clean sand and small pebbles so walking is quite easy. 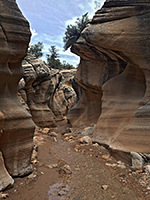 Near the road, the creek drops 3 feet into a narrow sandstone channel which deepens gradually, the enclosing cliffs becoming up to 30 feet high. Occasional small waterfalls form where the floor drops over small chokestones, and the canyon has several quite lengthy curving, narrow passageways, nicely illuminated when the sun shines, and always very photogenic. After one mile the creek is joined by Averett Canyon from the north and thereafter becomes wider and more V-shaped. Pine trees and bushes grow around the streambed and the drainage remains similar in character for the next mile, to the confluence with larger Sheep Creek. Two loop hikes are possible - either the 14 mile circuit of Bull Valley Gorge/Sheep Creek/Willis Creek (best done in this clockwise direction as the gorge is easier descended than ascended), a journey that includes 2 miles of road walking, or the much shorter 4 mile trip through Averett Canyon and Willis Creek. Averett has no narrow sections but is still quite pretty, and has the extra feature of a historic memorial, to a Mormon settler (Elijah Everett) who was killed by Indians in 1866. A dryfall near the junction with Willis Creek presents quite an obstacle so again this loop is easier done in this direction.